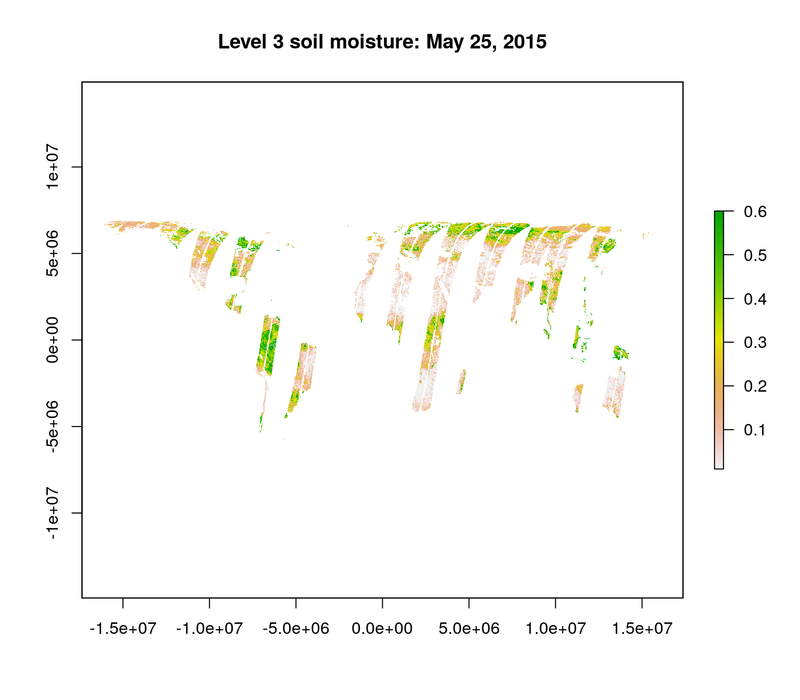 Facilitates programmatic access to NASA Soil Moisture Active Passive (SMAP) data with R. It includes functions to search for, acquire, and extract SMAP data. If a local installation is not possible for some reason, we have made a Docker image available with smapr and all its dependencies. In a web browser, navigate to localhost:8787 and log in with username: rstudio, password: rstudio. Access to the NASA SMAP data requires authentication through NASA's Earthdata portal. If you do not already have a username and password through Earthdata, you can register for an account here: https://urs.earthdata.nasa.gov/ You cannot use this package without an Earthdata account. Create a text file .Renviron in your home directory, which contains your username and password. If you don't know what your home directory is, execute normalizePath("~/") in the R console and it will be printed. Be sure to include a new line at the end of the file or R will fail silently when loading it. #>  $ name: chr "SMAP_L3_SM_AP_20150525_R13080_001"
#>  $ date: Date, format: "2015-05-25"
#>  $ dir : chr "SPL3SMAP.003/2015.05.25/"
Given a data frame produced by find_smap, download_smap downloads the data onto the local file system. Unless a directory is specified as an argument, the data are stored in the user's cache. #>  $ name     : chr "SMAP_L3_SM_AP_20150525_R13080_001"
#>  $ date     : Date, format: "2015-05-25"
#>  $ dir      : chr "SPL3SMAP.003/2015.05.25/"
#>  $ local_dir: chr "/home/max/.cache/smap"
The path "Soil_Moisture_Retrieval_Data/soil_moisture" was determined from the output of list_smap(downloads, all = TRUE), which lists all of the data contained in SMAP data files. expanded vignettes to include cropping, masking, etc.